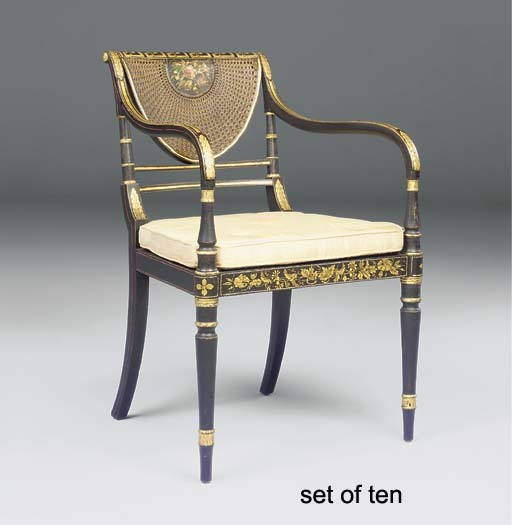 These japanned and light-framed chairs, designed in the French/antique fashion popularised around 1800 by the publications of Thomas Sheraton, relate in particular to the work of John Gee (fl. 1779-1824) of Wardour Street, 'Chairmaker and Turner in Ordinary to George III' (C. Gilbert, Pictorial Dictionary of Marked London Furniture 1700-1840, Leeds, 1996, figs. 376-394). In 1802 Gillows manufactured a related chair with circular caned back called in their Estimate Sketch Book a 'Montgomery' chair.